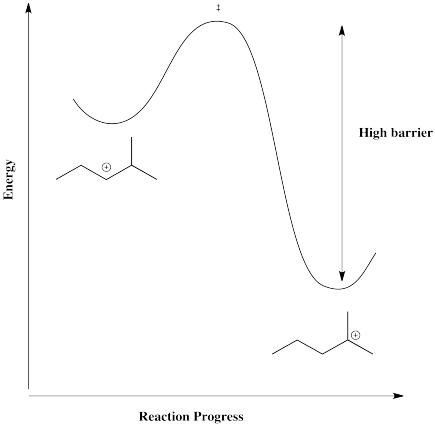 Many of the reactions of alkenes begin with a protonation step. The cation that forms then undergoes a second step in which it combines with the counterion from the acid. In the first step, the alkene's π bond is the nucleophile and the proton is the electrophile. In the second step, the bromide is the nucleophile and the cation is the electrophile. If you are familiar with nucleophilic aliphatic substitution, you will already know that the presence of a cationic intermediate signals some potential complications in this reaction. One issue is the problem of stereochemical control. A carbocation is trigonal planar, because the carbon with the positive charge has only three groups attached to it. Because the cation is trigonal planar, the bromide ion that combines with it can approach from either side. It can come from above or below the trigonal plane. That fact may have no effect whatsoever. However, if the alkene (and the cation it forms) is prochiral, meaning it has the potential to form a new chiral center during this reaction, then there is a choice of which enantiomer to make. A prochiral carbocation is easy to recognize because the cationic carbon has three different groups attached to it. The fourth group added, the nucleophile, would result in four different groups attached to that carbon, making it a chiral center. In order to recognize a prochiral alkene, you can picture what the alkene would look like after the reaction has taken place: will there be four different groups? Which of the following alkenes are prochiral? Addition of the nucleophile to one face of the alkene will result in a stereocentre with R configuration. That face is called the re face. Adding it to the other will lead to formation of S configuration. That face is called the si face. In the following alkenes, identify whether we are looking at the re face or the si face in terms of the product we would get through addition of HBr.. 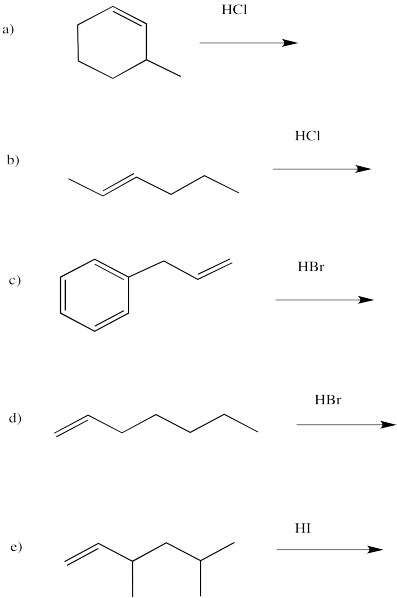 Draw the products of the following reactions, paying attention to stereochemistry. 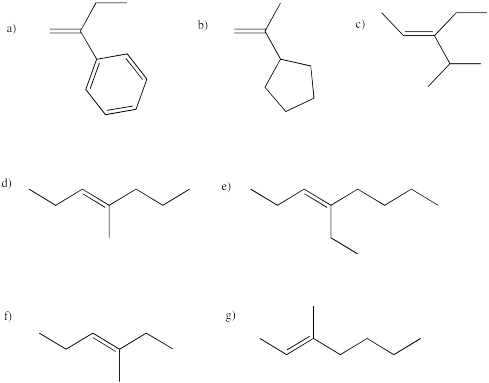 In addition to the problem of stereochemistry, electrophilic additions of alkenes also present potential regiochemical complications. As in aliphatic nucleophilic substitutions, formation of a cation often opens the door to rapid rearrangement via 1,2-hydride shifts. There may be one hydride shift or there may be many of them in a row. These hydride shifts happen pretty easily. Overlap of a hydrogen atom with the empty p orbital of the the adjacent cation leads to a short hop from one carbon to the next. A hydride shift from one secondary carbon to the next, as illustrated in the above example, is thermodynamically pretty neutral. Because the barrier is low, it happens quickly, but there isn't a driving force fo the hydride to shift one way or the other. Instead, both cations result. There is a mixture. 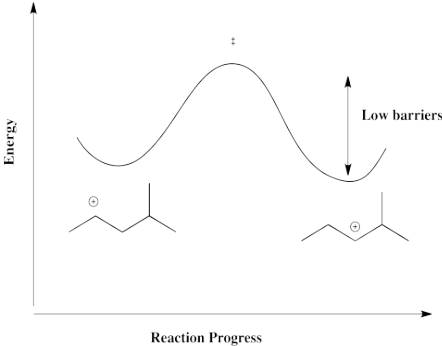 However, in a case in which the cation can form in a more stable position, such as a tertary position, there is a driving force for the reaction to go one way. The barrier would be too high for it to get back. As a result, when the counterion combines with the cation, it may do so in a position away from the original double bond. Draw the products of the following reactions, paying attention to regiochemistry.